This study is aimed to find out the influence of training habits on the lower limb (hip, knee, ankle) kinematics of junior school girl students, and compare it with the parameter of adults to find out the characteristics of the lower limb kinematics in Juvenile stage, and more desired to explore the law about it to provide the basis for physical training in juvenile stage. Thirty junior school girl students age at 13 to 14 years old participated in this study, of which 15 participants have exercise habits and 15 participants without exercise habits. The Vicon kinematics analysis system (Oxford, Metrics, Ltd., Oxford, UK) with a shooting frequency of 200Hz was used to collect the three-dimensional kinematics of the hip, knee and ankle joint. The study found that the exercise group in step and pace were higher 7.1% and 6.4% respectively than non-exercise group, but in step frequency, 7.7% lower than non-exercise group. In terms of joint angle, compared with participants without exercise habits, participants with exercise habit showed decreased angle of ankle with dorsiflexion, increased angle of the ankle with plantarflexion, and significant peak angle of plantarflexion; meantime, exerted increased angle of eversion and decreased angle inversion which were more similar to the kinematics parameters of adult women. During the push-off period, there was an obvious increase in non-exercise group’s angle of ankle with eversion, which may be one of the reasons for the phenomenon of “outer eight feet” in the juvenile. The physical parameters of the participants with exercise were more approximated to the adults’, indicating that exercise habits have positive effects on the stability of joint, such as the joint force can be better controlled, improving the walking stability, and avoiding injury. Motor skills of some activities such as running, walking or jumping, are essential in most children’s physical activities. Many children are participating in organized sport activities, such as endurance races, resulting in leg injuries increase (Krabak, Snitily, & Milani, 2016). In this context, variables such as rear foot eversion (Pohl, Hamill, & Davis, 2009) and misalignments in lower limbs (Barton, Levinger, Menz, & Webster, 2009) have been associated to running-related injury risk (Latorre Roman, Balboa, & Pinillos, 2017). Junior middle school is a sensitivity and critical period for junior student’s body development and Joint growth. Mastering the conditions of students’ body posture and muscle development is helpful to guide students to form the correct walking posture, plan individual training for students, explore scientific and feasible training methods, form the correct body posture for students, enhance the strength and condition, and develop students’ interest in sports activities. For long term exercise students, there are considerable variations of gaits in space and time parameters and kinematics parameters. Their pace and step length were obviously increased during the long term exercise; the gait cycle was significantly smaller than the students not engaging in sports. The long term exercise students’ maximum ground reaction force, the ground reaction force integral, ground reaction force time parameters were significantly higher than that of the non-exercise students, but the peak pressure and the ground force were reduced. Physical exercise is beneficial to enhance muscle strength, improve gait stability, and also has a positive effect on gait. However, few studies were conducted to analyze the influence of exercise habits on the biomechanical characteristics of lower limb gait in junior high school girl students. In reality, there were some phenomena of faulty running posture and movement not in place, including splayed feet, thighs not lift or less lift, sitting running posture, Clamping arms during running and so on, which seriously affected the improvement of students’ grades and the formation of correct running posture. For a long time, it may cause changes in body shape, even damage to the body and affect the posture. The energy consumption of An abnormal gait pattern is more, which can result in poor endurance, and increase stress on joints causing problems with pain in adulthood (Andersson & Mattsson, 2001). Deviations in the movement pattern can be a primary disorder, or a compensation for problems in adjacent joints (Gage & Novacheck, 2001). It is of great value to normalize the gait pattern in order to reduce energy consumption, increase speed and prevent future problems with pain (Eek, Zügner, Stefansdottir, & Tranberg, 2017). Therefore, this study hopes to use biomechanics methods to quantitative analyses the junior girl students’ body kinematics parameters during walking. And this study compared the students having exercise habits with students without exercise habits and adult women in kinematics parameters to find out the faculties and defects between them, the influence of exercise habit on lower limb kinematics in junior middle school girl students and the difference of adult women on limb kinematics. Than according to the results, planning and implementing the scientific and feasible lower extremity strength and postural training programs. This study selected 30 healthy junior high school girl students as participants involved in the study, all participants were come from Tianxingeng middle school, and had no leg or foot disease in the past half year, the exercise group and non-exercise group both were 15. Paired T test showed that there was no significant difference of Body indexes between the exercise group and the non-exercise group. Exercise group under the condition of complete school sports teaching activities every day, even for an hour of sports training activities, while control group only to participate in the activities of the school sports teaching. All participants agreed to participate in the study. Gait biomechanical parameters was the mainly indexes of this study, all participants were naked feet and divided into 15 healthy junior high school girl students with exercise habits as exercise group and 15 junior high school girl students with non-exercise habits as non-exercise group (Table 1). Before the experiment, participants were asked to walk barefoot for 10 minutes in order to adapt to the effects of barefoot walking. Test data was based on the participants’ right lower limbs, and differences of gait biomechanical parameters between the training group and the non-training group were compared and analyzed. This study was conducted in the Ningbo University sports biomechanics laboratory, three-dimensional kinematics analysis used 8 infrared camera of Vicon motion analysis system (Oxford Metrics, Ltd., Oxford, UK) to capture the kinematics, the shooting frequency was 200 Hz. The angle, midpoint, and axis of rotation were defined by the standard position of the mark point (Charalambous, 1990). Participants were asked to wear tight shorts, 16 reflection (diameter 14 mm) were pasted around the outside of lower limb: anterior superior spine, mid-thigh, knee joint, mid-calf, femoral epicondyle, ankle, the second metatarsus head and calcaneus. The signs of the heel and toe part were posted in the anatomical position of the shoes. The gait cycle is divided into the initial support stage (0–10%), the middle support stage (10–30%), the end support stage (30–50%), the push-off period (50–60%) and swing phase (60%–100%). Before the test, the participants could choose their best controlled speed to walk along the 12 m walkway. This study selected two step stable gait data of each test are analyzed, in order to reduce the experimental error. The two most stable gait data of each test were selected for analysis in this study to reduce the experimental error. The basic situation of the subjects. Indicators for statistical data analysis were joint range of motion (ROM) and three dimensional kinematic data of the right lower extremity including the angle peak of the hip, knee and ankle. SPSS20.0 software (SPSS, Chicago, IL, US) was used for statistical analysis. The differences between the exercise group and non-exercise group of the kinematic test indexes were analyzed by Repeated Measures ANOVA and Bonferroni post hoc. The significance level was set at 0.05. Based on the basic kinematic parameters (Table 2), there was a significant difference between the exercise group and non-exercise group in the step length, step frequency and pace. The step length and walking speeding of the exercise group were higher 7.1% and 6.4% respectively than non-exercise group, but more approached to the adults’ comparing with the gait data of adult females. This should be attributed to the exercise has strengthened the force of ankle, increased the flexibility of ligament, pushed off more fully at toe finger joint, increased the pace during walking. Thus there was increasing trend of the step and pace. The walking speeding of the exercise group was 7.7% lower than non-exercise group, this might be due to the increased step length has extended the muscles, and then the step frequency decreased. Time distance parameter (n = 22). Note: *Indicates that there was a clear difference between the two (P < 0.05). **Indicates that there was a very clear difference between the two groups (P < 0.01). 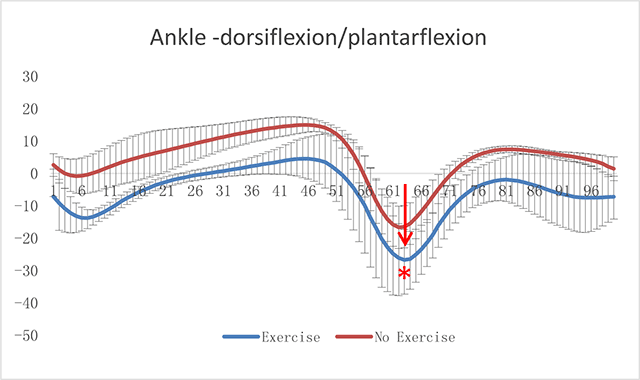 There was a significant difference between group with exercise habits and non-exercise one in the angle of the ankle with dorsiflexion and plantarflexion, from the Figure 1, the angle of ankle with dorsiflexion of the group with exercise habits was smaller than the non-exercise group, but the angle of the ankle with plantarflexion showed increasing trend, and the peak angle of the ankle with plantarflexion showed significant difference. This was thought to contribute to the exercise has strengthened the force of ankle, increased the flexibility of ligament, pushed off more bigger at forefoot, then the angle of ankle with dorsiflexion increased. The results more approached to the peak angle of the ankle with plantarflexion of adult women (24.69 degrees). The ankle angle changing curve in sagittal plane (*indicates a significant difference, P < 0.05). Compared the group with exercise habits with non-exercise group in the ankle with eversion or inversion angle, this study discovered that participants with exercise habits had bigger ankle eversion but smaller inversion trend, and the difference of ankle eversion peak between them was significantly different (Figure 2). But during the push-off period, non-exercise group‘s angle of ankle with eversion was obviously higher than exercise group. Exercise group’s ankle angle changing curve in horizontal plane, especially during the push-off period, was more similar to adult women’. During the push-off period, the angle of ankle with eversion quickly increased, and the force rapidly transferred from the inside of foot to the outside of the foot which caused the push-off force increased and then the step length lengthened. In the contrary, the increase of angle of ankle with eversion didn’t transfer the force to the outside of foot, but the force gathered in the big toe which was easily to cause the big toe injury. The reason might be found that the forefoot area didn’t get enough exercise, so the force of the forefoot area was very weakness which exerts an opposite force to the force transfers to the outside of foot. The ankle angle changing curve in horizontal plane (*means a significant difference, P < 0.05). The ankle internal rotation range of exercise group show obviously lower trend than non-exercise group. 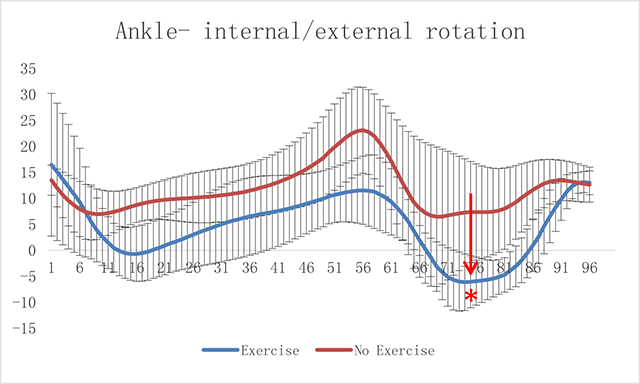 Especially during the push-off period, the ankle internal rotation of non-exercise group appeared a significant increase trend, while the non-exercise group kept relatively smooth (Figure 3). This might contributed to the strength of the muscles outside of the forefoot was weakness, during the push-off period, the ankle transferred the force to inside of the foot by internal and external rotation to keep the lateral of the forefoot loads less force. In the swing phase, the external rotation range shown a clearly increasing trend while the external of non-exercise group was relatively smaller, and there was a significant difference between them. The exercise group was more closer to the previous results of the adult female ankle angle curve, the reason should be found by analysis that force transferred to the outside of the foot which was the driving force of the ankle external rotation resulting in swing phase appeared ankle external rotation trend, this provided the conditions for lateral heel landing in the next gait cycle. 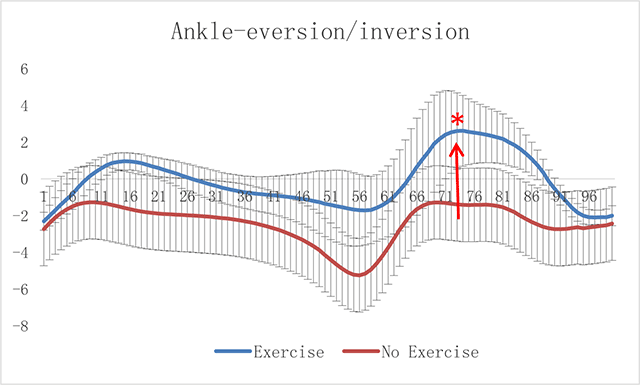 The ankle angle changing curve in coronal section (*means a significant difference, P < 0.05). 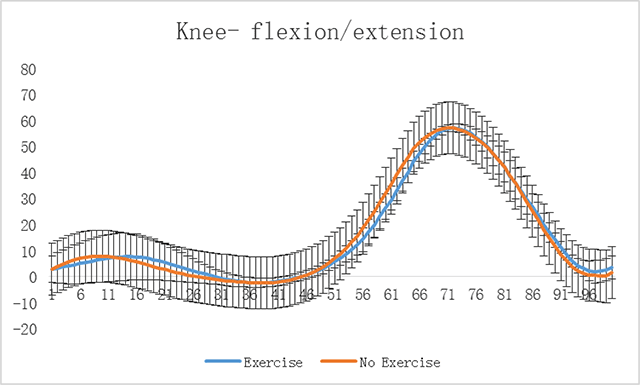 There was no significant difference between participants with exercise habits and non-exercise group in the angle of knee flexion and extension (Figure 4). The results compared with the data of the young population shown that the maximum angle of knee flexion was considerably difference from the adults’ during the early fall and swing phase. This declared that the junior middle school stage girls’ knee angle changing trend had few difference with the adult during the walking, but the flexion range of the knee angle had not reach the demand of adults which might due to the strength of the knee and the articular ligament were still not fully developed so couldn’t bear greater flexion range demands. It also points out the direction for the middle school sports teaching that should strengthen the leg strength training of the students, especially the strength exercise near the knee joint muscle. The knee angle changing curve in vertical plane (*means a significant difference, P < 0.05). The angle pf the hip flexion of the training group with exercise habit was greater than non-training group, found by comparing the angle of the hip flexion and extension, but showed no significant difference (Figure 5). This might result from the muscles strength of the hip and legs of the exercise group has gained more fully trained. The thigh contracted more fully causing the much bigger extension angle of the hip in the swing phase. 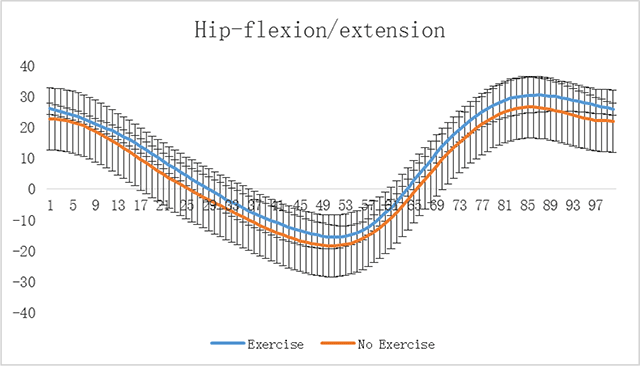 In final support stage participants with exercise habits has no significant difference of peak of the hip extension, compared with the data of the hip angle of adult female, but the peak of the hip extension the non-exercise group was higher than adults which might due to the lack of the hip muscles strength couldn’t control the hip motion causing the hip extension excessively. The hip angle changing curve in vertical plane (*means a significant difference, P < 0.05). Junior students are in a critical period of body development and growth, their lower extremity kinematics has differences with adults. The lower extremity kinematics of junior girls with exercise habits was much similar to the adults which illustrates the exercise is beneficial to the growth and development of the lower extremity joint and muscles to making the waking posture much reasonable and avoid the possible injury effectively. Students with exercise habits shown some advantages in step and pace than students without exercise habits, the muscle forces of lower extremities has been developed by increasing the step size and reducing the pace improved the gait stability. The participants with exercise was similar to the adults in the changing angle of ankle plantarflexion, ankle external rotation and ankle extension. All proved that exercise habits have positive effects on the stability of joint, such as the joint force can be better controlled, improving the walking stability, and avoiding injury (Krabak et al., 2016). But the effects of lack of physical exercise and sports on health have a lag decided by the characteristics of the body adapt to stimuli. Therefore, the cultivating the students have sports hobbies and good exercise habits even interested in physical exercise to participate in sports activities have significance means to improve the physical quality of the whole nation. Gage, J. R. and Novacheck, T. F. (2001). An update on the treatment of gait problems in cerebral palsy. Journal of Pediatric Orthopedics Part B 10(4): 265–274.